>Eureka Springs is unique because people who visit here boast about how friendly the community is. It is a tremendous asset to have a vacation destination that is “Always Welcoming”. >The community is adjacent to two rivers (Kings and White) and three lakes (Beaver, Table Rock, and Leatherwood). All five liquid playgrounds are perfect for that first kayaking or boating excursion of the year and/or a fishing expedition that the winter has cruelly delayed. 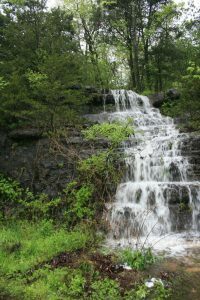 >A new golden asset for Eureka Springs is the host of new and numerous soft hiking trails many with waterfalls. Eureka offers tame trails for all levels most and each is wonderfully scenic. You will love the dozens of urban trails that crisscross the hills-n-hollers of the town. Many of these have trailheads adjacent to lodging sites, such as those at the Crescent Hotel at the top of the mountain. >Spring Diversity Weekend has become a chance for members of the LGBTQ community from a five-state area to gather and celebrate the love of freely being who they are. Eureka Springs rolls out the rainbow carpet that says, “Welcome to a loving city that has acceptance as part of its fabric”. >April in Eureka is the time to dust off your golf bag and start honing your swing pattern. With championship courses that include Holiday Island and nearby Branson, your game is only interrupted by a pause to gaze at the panoramic views from the links. >For those who would like to know more about visitors from other planets, other galaxies, the annual UFO Convention convenes here in April. It is a time to find out more and share with others your thoughts and experiences, comparing yours to theirs. >Springtime In The Ozarks is a four-day annual event for those who are members of the AA fellowship or are seeking more information about this long-standing program that helps members with their addiction to alcohol. Noted speakers fill the days and outstanding fellowship activities fill the nights as “friends of Bill W.” gather with nearly 3,000 in attendance. >The Spring Fling is the huge annual biker rally that welcomes good weather and encourages 5 Days of Fun Riding, Music, Food and More at the Cathouse in Downtown Eureka Springs. >If you like to visit a yard sale now and then, you need to visit Eureka Springs during the “Yards and Yards of Yard Sales”, a full weekend of finding everything you want and perhaps even some things you need. A helpful map leads you to each and every yard participating and there are nearly 100 scattered across Western Carroll County. Be sure to bring a vehicle with a large trunk or truck bed… you will need it. > Let us also mention all the quality restaurants of Eureka Springs. Here you will find the greatest assortment of unique, non-chain restaurants that get major rave reviews from foodies. Inside the Crescent Hotel alone you will find two of these: The Crystal Dining Room and SkyBar Gourmet Pizza. And on April 5th, Main Street Eureka Springs provides a unique opportunity to sample many of these during “Main Street Eats” a progressive dinner.>Add to that the great year ‘round attractions like Turpentine Creek Wildlife Refuge, Intrigue Theater, Basin Ghost Adventour and the Crescent Hotel Ghost Tour (to name just a few), plus the Crescent Hotel’s resort activities and your days and nights are complete. You are encouraged to make your reservations now so you can have a bed for your head for the nights after full and fun-filled days. Instagram is awaiting your images!